The military is likely to buy fewer fifth generation T-50 fighters, scaling back requirements to 12 after initially planning for 52, due to economic considerations, Deputy Defence Minister Yuri Borisov has said. The military may buy a smaller number of fifth generation T-50 fighter jets (Prospective Airborne Complex of Frontline Aviation – PAK FA) than earlier planned, Deputy Defence Minister in charge of Armaments, Yuri Borisov, has said. According to Kommersant, the military will buy only 12 fighters initially and, after their operational testing and commissioning, will decide on how many more aircraft of this type it can afford. They had previously made commitments to acquire 52 aircraft according to the State Armament Program until 2020. Borisov announced the likely reduction in the total purchases during a visit to the Komsomolsk-on-Amur Aircraft Plant, adding, “the company is ready to start mass production of the fifth generation fighter starting in 2016”. However, the Deputy Minister added, the Ministry of Defence reserves the right to revise the number of units purchased. “Given the new economic conditions, the original plans may have to be adjusted,” he explained. “It is better to have the PAK FA kept as a reserve, and later move forward, while squeezing everything possible for now out of the 4+ generation fighters (Su-30 and Su-35 – Kommersant). Yuri Slyusar, President of the United Aircraft Corporation (UAC) told Kommersant that the Ministry of Defence has coordinated this position and consulted with his company. These plans were actually feasible, he said, before the economic difficulties arose in the country. “We have now reached an understanding that, to begin with, we will sign a contract for a squadron of T-50’s (12 aircraft – Kommersant). After that, we will decide how many of them we still need – and how much we can afford,” the source said. At the UAC, they declined to comment on this report. Work on the PAK FA project started in 2002, and two years later, a model of the aircraft was presented to Russian President Vladimir Putin. In 2010, Putin said that the first phase of the aircraft’s development had cost around 30 billion rubles. For completion of the project, a similar amount would be required. 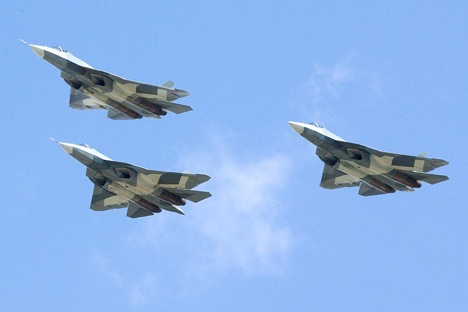 During this period, six flying prototypes of the PAK FA were created. Borisov said the military still expects to receive four additional fighters before the end of 2015 for testing. In addition, in 2015, the company would also deliver 14 multi-role Su-35 and five Su-30M2 fighter jets to the military, he said.